Last year has been insane with the move, renovations and work travel. I admit I turned into you with no ideas or plan for dinner. Instant Pot saved the day many days! Last fall with 2 work trips on my calendar, I was forced to make healthy make ahead dinners because Alex was busy renovating our beach house and taking care of the kids. Alex kept raving and raving about how easy and tasty each dinner was. He was truly blown away how my healthy bulk cooking made his cooking easy. And last time I heard my husband rave like that was about his new truck! 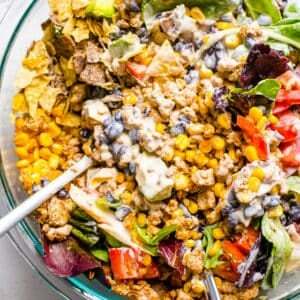 What Are Your Healthy Freezer Meals? Batch cooking 5 recipes in 2 hours for freezing. 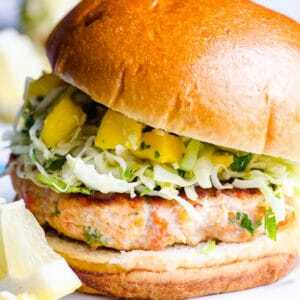 Dinners made with real food. Cook from frozen in Instant Pot. 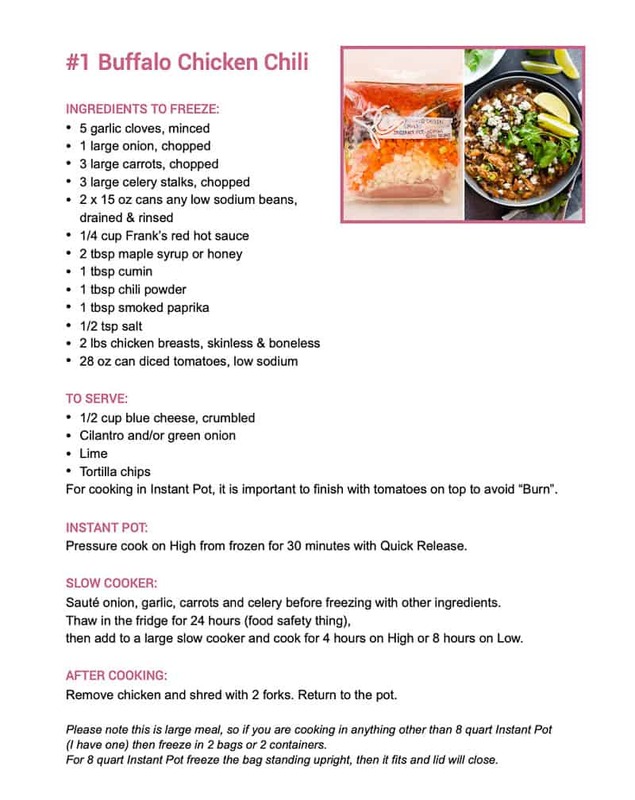 Cook from frozen in Slow Cooker (except thaw meat ones first – food safety). 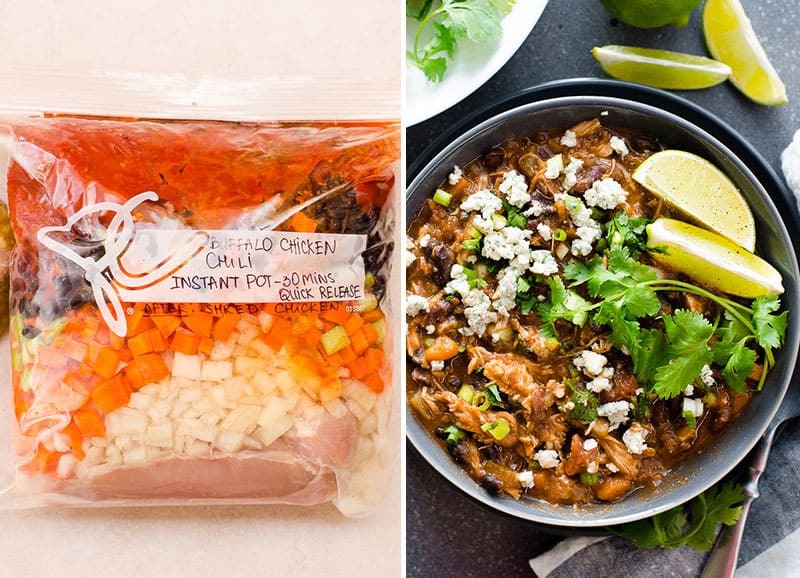 Healthy freezer meals on a budget. 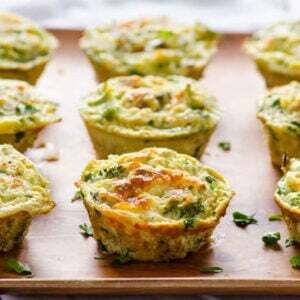 HEALTHY MEAL PREP #1 – Click here for Recipes + Shopping List. Gather meat, vegetables, cans and sauce jars, and grains on a counter. 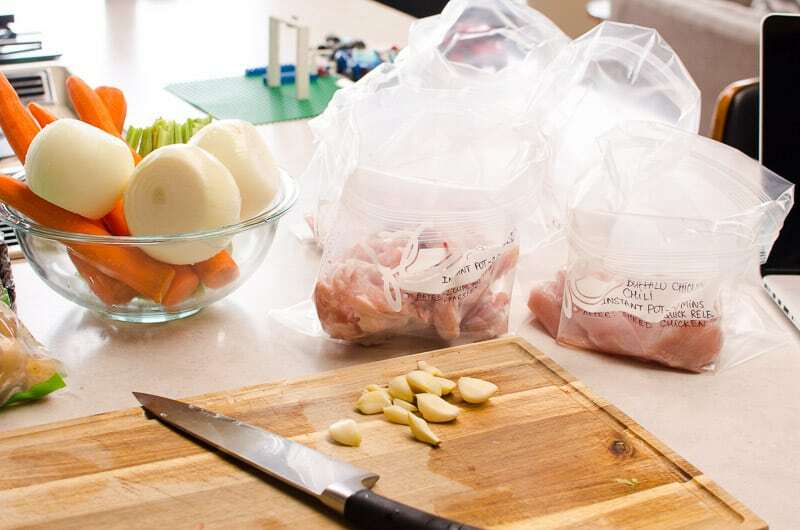 Label gallon size Ziploc bags with instructions. Peel vegetables ( do not chop yet). Fill each bag with meat first. 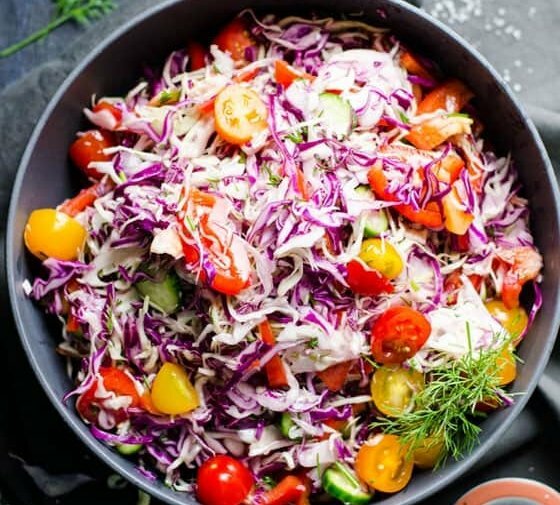 Chop basic veggies like carrots, celery, onion, garlic, potato etc. for each recipe individually. Then place on top of meat (if any) in each bag. It helps to keep measuring simple. Meatless recipes assembly begins now. DO NOT add broth or water. 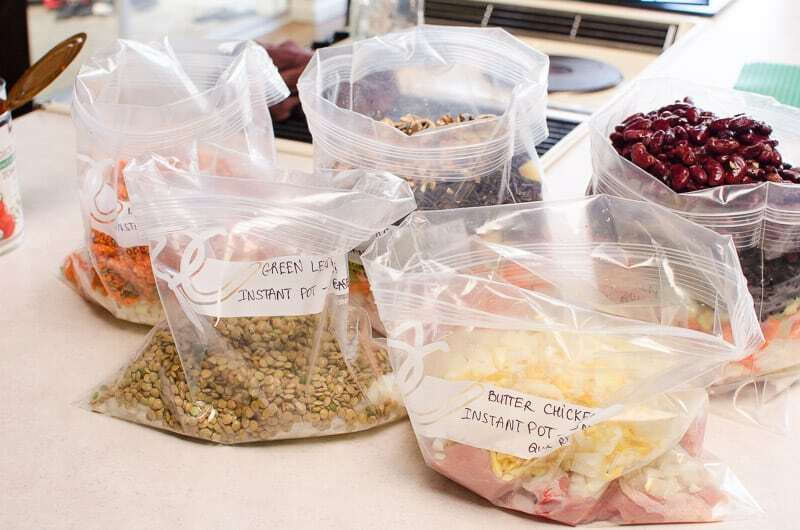 Pull out spices, measure and add to each bag. Let out as much air as possible and seal tightly. Gallon Size Ziploc Bags: It is true you cannot recycle bags in your curbside blue box. Option 1: Wash, dry and re-use (ME!). Option 2: Collect and take directly to nearby recycling depot. 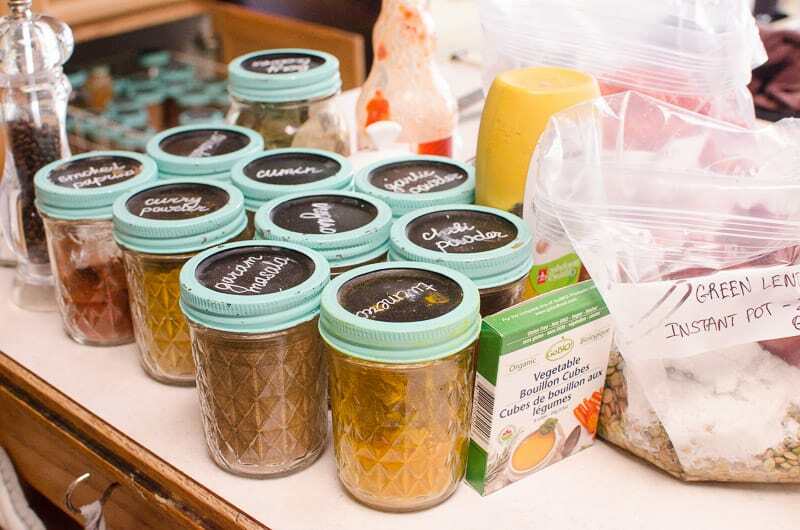 Plastic Containers: You will need large containers, preferably round shape to fit easy into Instant Pot or slow cooker. A good option since they are reusable. Glass Containers: These are heavy and pricey but another good option. Look for large round ones as well. Container. 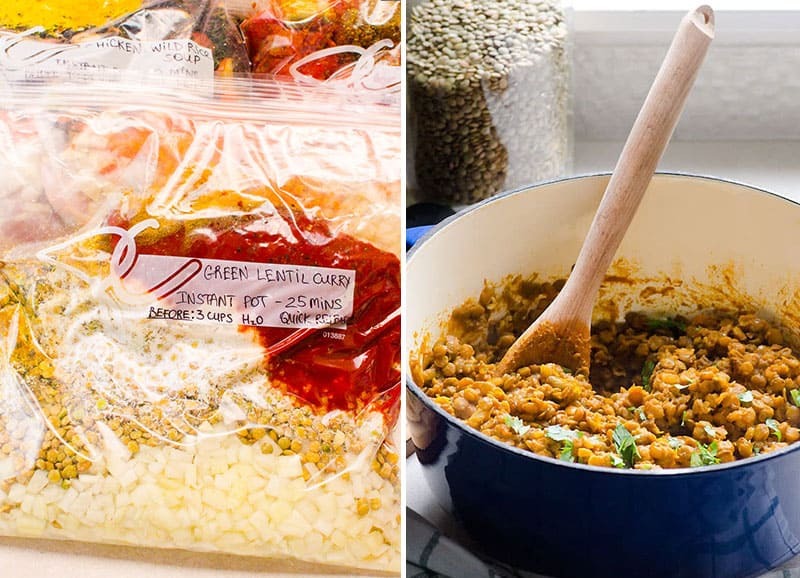 Pick your container with the size of your preferred cooking vessel in mind – will it fit frozen? Round shape is the best. With both slow cooker and Instant Pot. Use round containers or place filled bags in round bucket and freeze until shape forms. Thaw for 2 minutes. 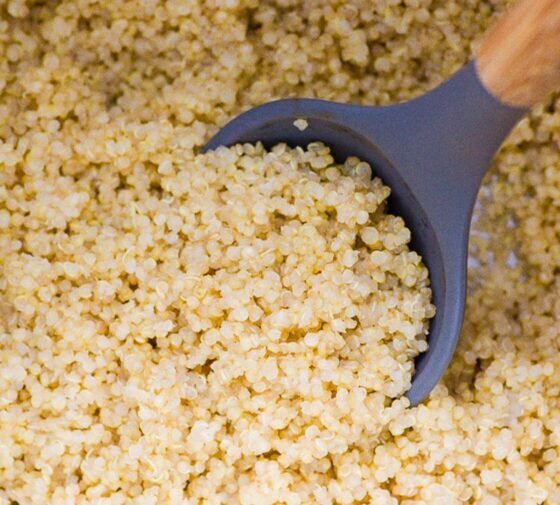 Place frozen container in a sink or large bowl with hot water and let defrost for 2-5 minutes to help slide out easily. 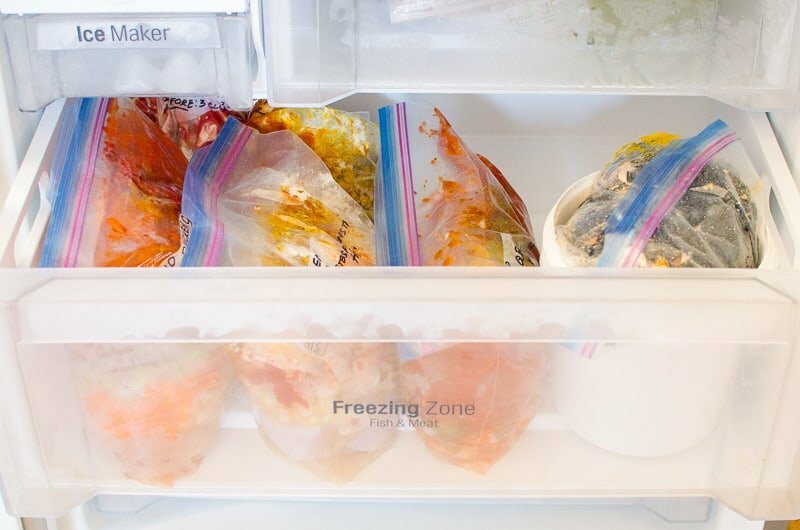 You can also let thaw longer and break frozen food into a few pieces if necessary. Scrape the walls. If any spices left on the walls of a container and recipe calls for water, rinse container with it and then add to your cooking vessel. Appliance to use. To cook healthy frozen meals, you need to own at least 6 quart or my absolute favourite 8 quart Instant Pot, or large slow cooker. Cook from frozen. For all Instant Pot and vegetarian slow cooker meals. Tomatoes on top in Instant Pot. If cooking recipe in Instant Pot and it contains anything tomato, make sure its on top – otherwise it will burn. Meat in slow cooker. 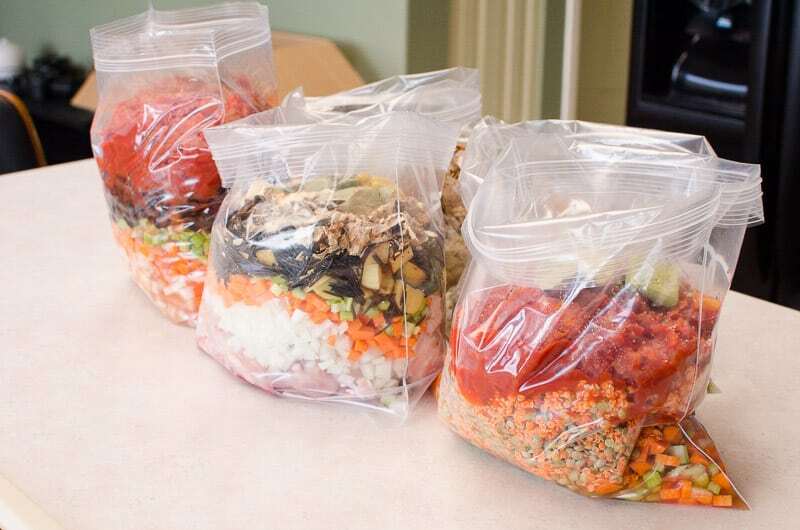 For slow cooker meals with meat you have to thaw freezer meal in the fridge for 24 hours. Use common sense. As much as you can please. I used less meat for making 3 recipes below because all I had was a whole chicken. Save time. 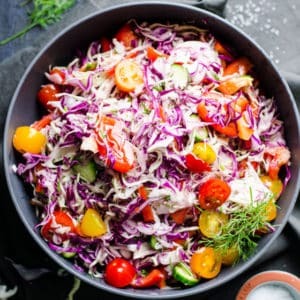 Group meals based on similar ingredients for faster meal prep. Below I will sort mine into meal prep #1, meal prep #2, meal prep #3 etc. 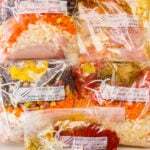 How Long Is Healthy Freezer Meal Prep? One day it took me 2 hours to assemble 5 freezer meals and that’s including taking photos for this post. Think about it – 2 hours and 5 dinners are taken care of. Totally worth it for new moms, working moms, any sane moms! For cooking in Instant Pot, it is important to finish with tomatoes on top to avoid “Burn”. INSTANT POT: Pressure cook on High from frozen for 30 minutes with Quick Release. SLOW COOKER: Sauté onion, garlic, carrots and celery before freezing with other ingredients. Thaw in the fridge for 24 hours (food safety thing), then add to a large slow cooker and cook for 4 hours on High or 8 hours on Low. 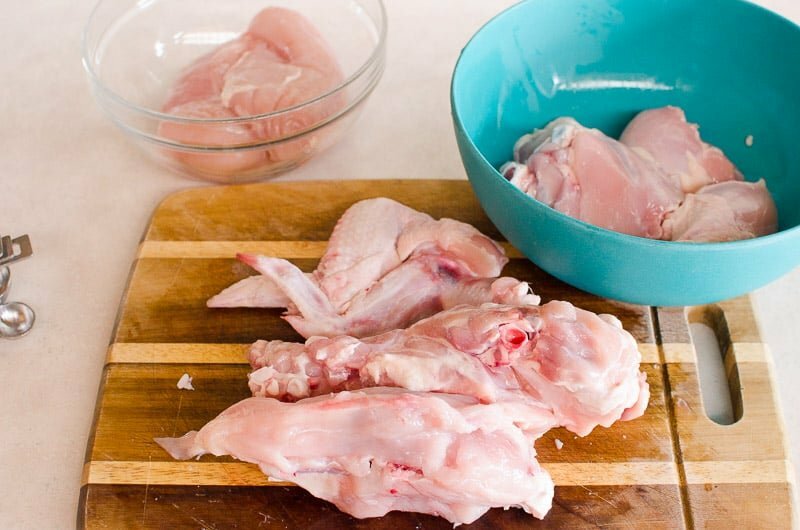 AFTER COOKING: Remove chicken and shred with 2 forks. Return to the pot. BEFORE COOKING: Add 3 cups of water. INSTANT POT: Cook from frozen for 25 minutes with Quick Release. 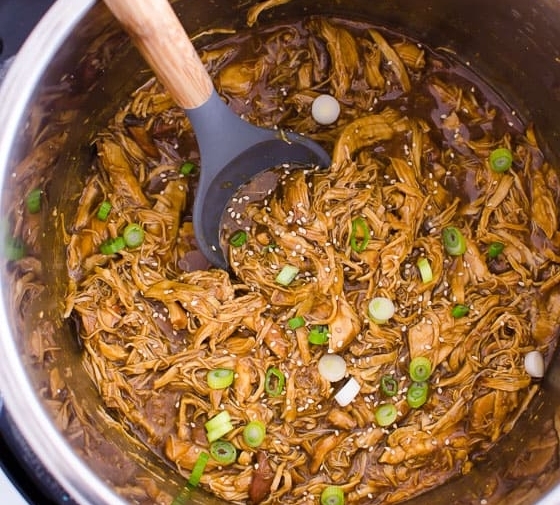 SLOW COOKER: Cook from frozen on Low for 9 hours or on High for 5 hours. BEFORE COOKING: Add 2 cups water. 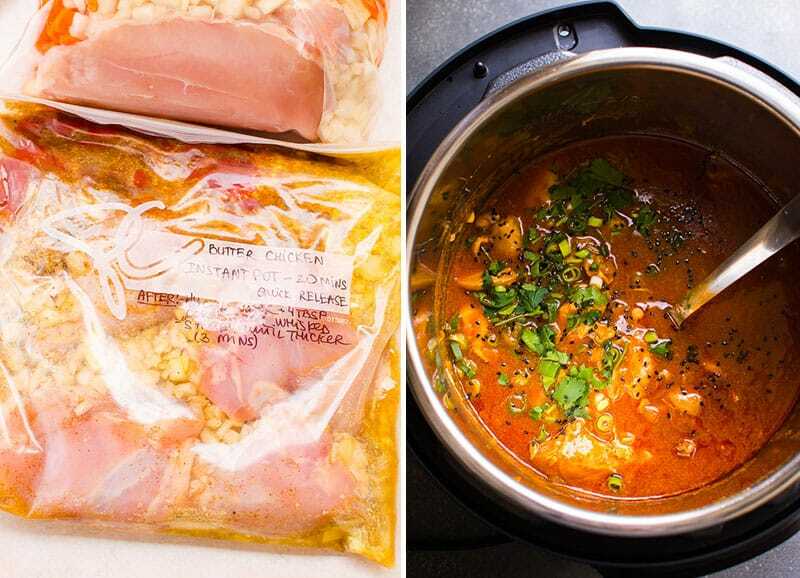 INSTANT POT: Cook from frozen for 30 minutes with Quick Release. 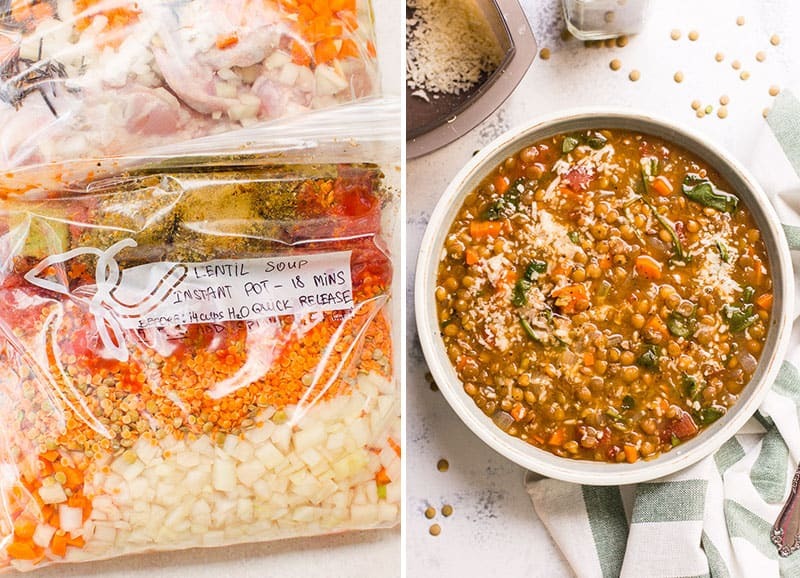 SLOW COOKER: Thaw in the fridge for 24 hours before cooking. Cook on Low for 8 hours or on High for 4 hours. AFTER COOKING: Open the lid and press Sauté (cancel Keep Warm if it’s on). In a small bowl, whisk water and cornstarch with a fork. Pour over chicken and stir gently. Cook for a few minutes until sauce has thickened a bit. 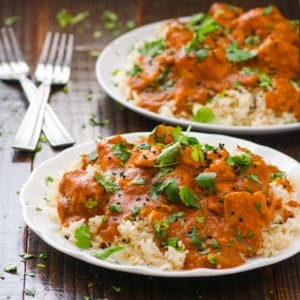 Serve with cilantro over a bed of brown rice and with naan/pita bread. 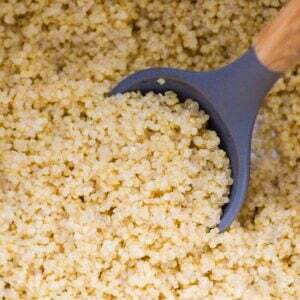 For 6 quart Instant Pot. 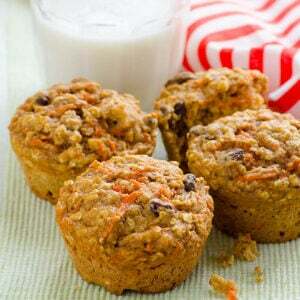 For 8 quart, check the recipe. BEFORE COOKING: Add 2 bouillon cubes + 10 cups water or 10 cups low sodium veggie stock. INSTANT POT: Cook from frozen for 20 minutes with Quick Release. 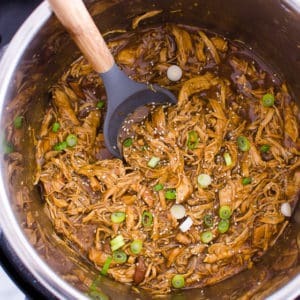 SLOW COOKER: Cook from frozen on Low for 10 hours or on High for 5 hours. AFTER COOKING: Add spinach and garlic. Stir and serve hot garnished with Parmesan cheese. BEFORE COOKING: Add 9 cups water or low sodium chicken broth. INSTANT POT: Cook from frozen for 35 minutes with Quick Release. 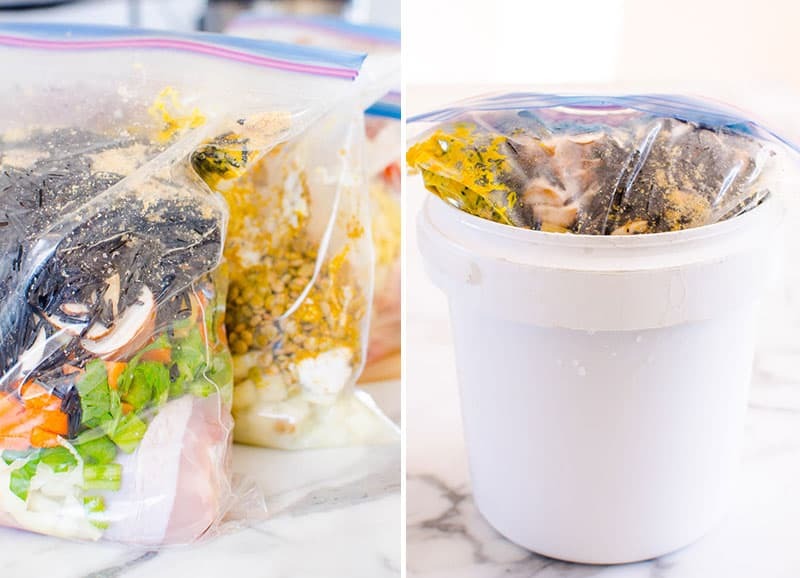 SLOW COOKER: Thaw in the fridge for 24 hours before cooking. Cook on Low for 10 hours or on High for 6 hours. Remove chicken and shred with 2 forks. Blend a bit with an immersion blender until desired consistency. Add chicken and parsley. Stir and serve hot. 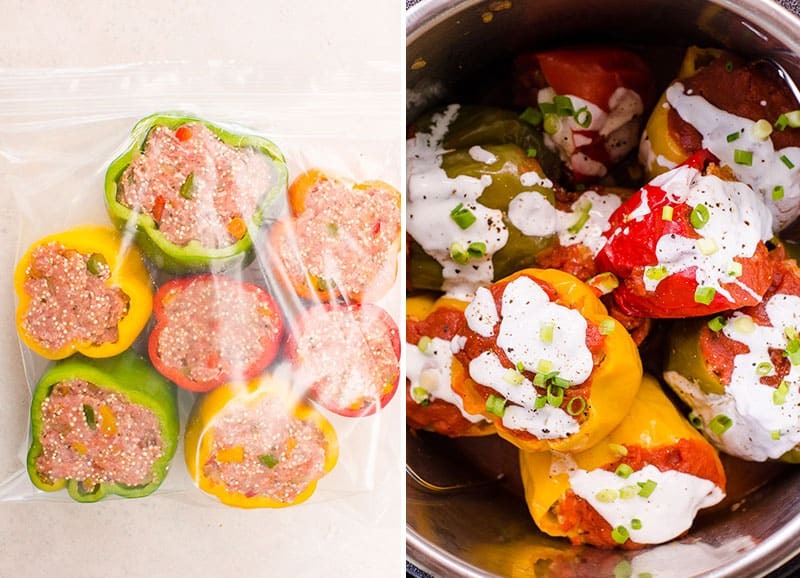 Click here for Stuffed Peppers recipe. Slow Cooker: Thaw in the fridge for 24 hours before cooking. Cook on Low for 6 hours or on High for 3 hours. 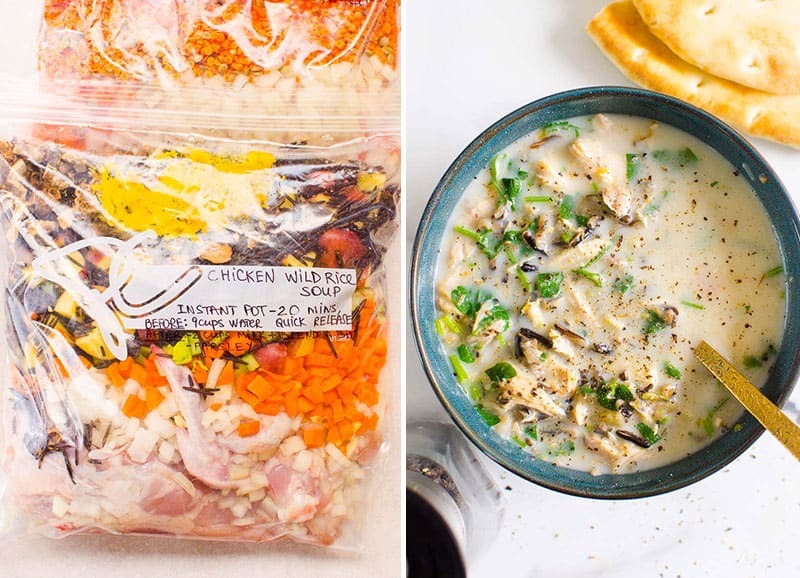 Instant Pot: Cook from frozen for 20 minutes. Quick release. 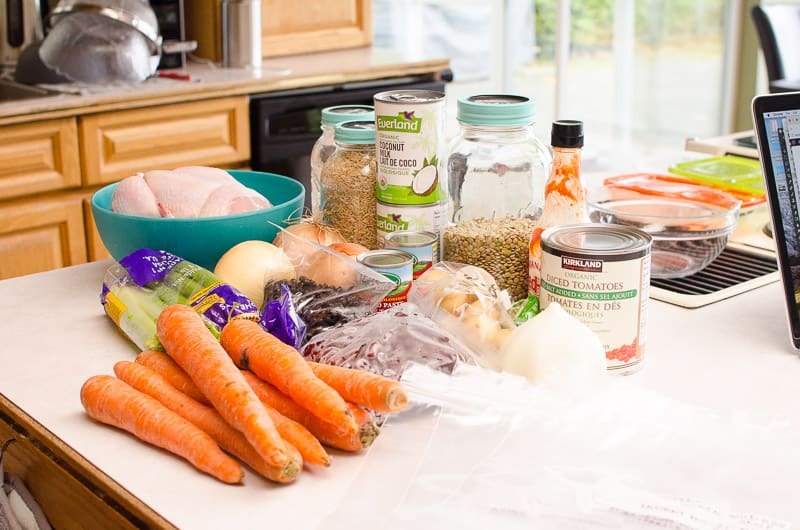 Instant Pot – 20 mins, QR OR Slow Cooker – Low 6 hrs, High 3 hrs. Before – triver + 1 cup water + 15 oz can tomato sauce on top. 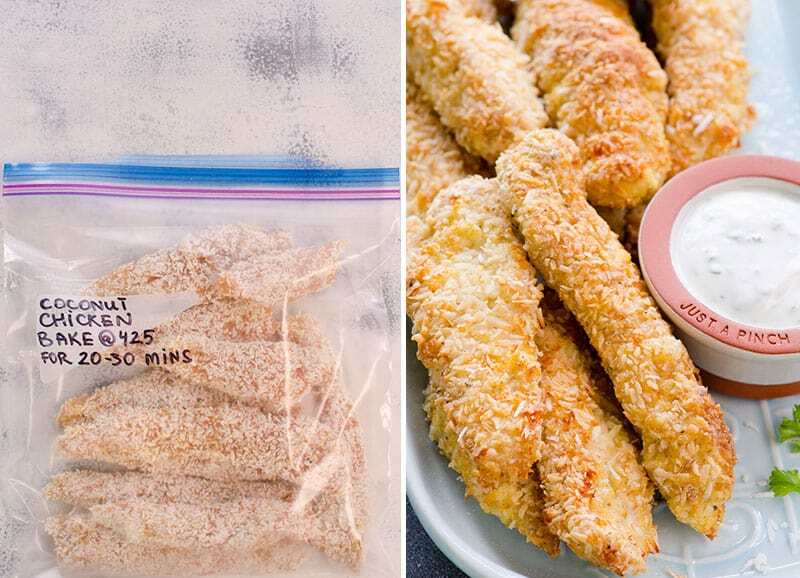 Click here for Coconut Crusted Chicken recipe. Oven: Bake from frozen at 425 degrees F for 30-35 minutes, possibly turning in the middle (depends on the oven – just keep an eye on them while chopping salad :)). Bake frozen at 425 for 30+ mins (maybe turn). 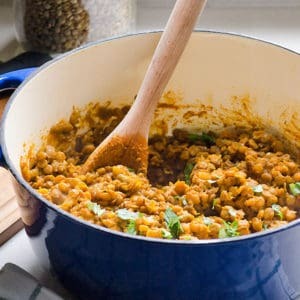 Click here for Chicken Chickpea Stew recipe. 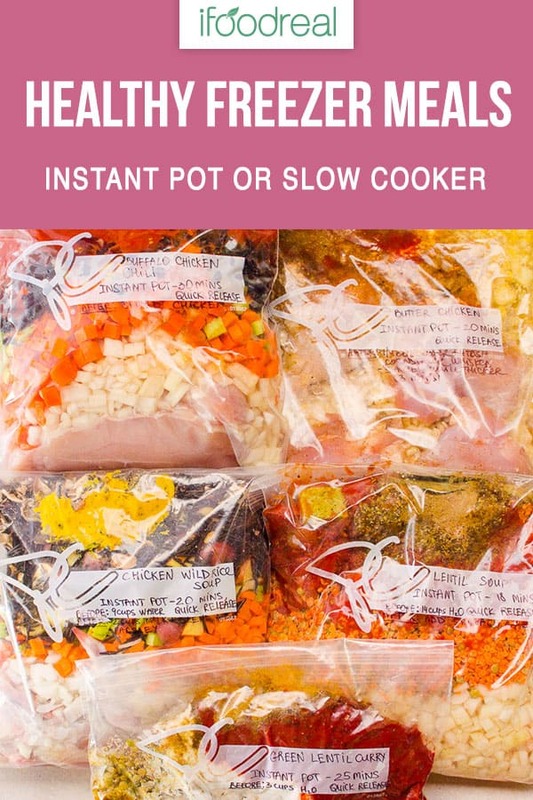 Instant Pot – 20 mins, QR OR Slow Cooker – Low 8 hrs, High 4 hrs. Before: 2 cups water. After: 1/2 cup tahini, 1/2 cup parsley. 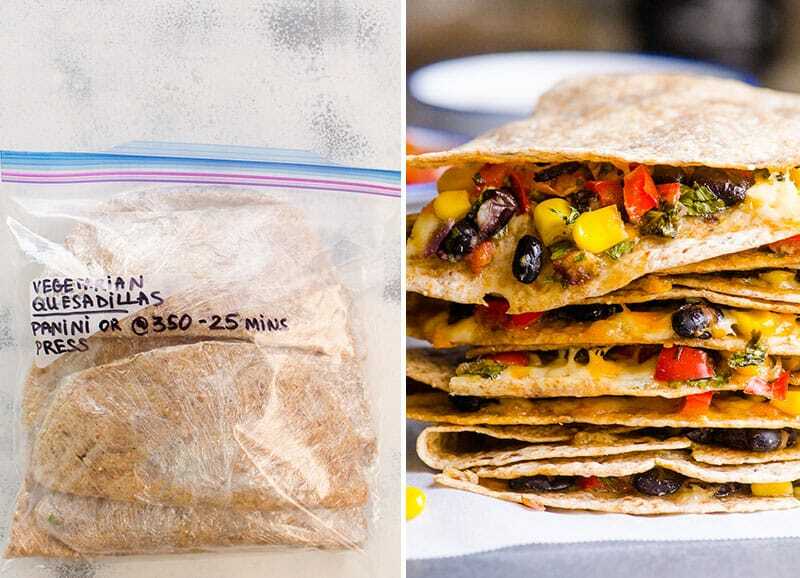 Click here for Vegetarian Quesadillas recipe. Bake: Bake from frozen at 350 degrees F for 25-30 minutes. 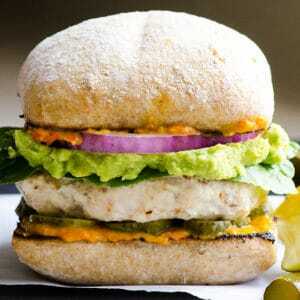 Panini Press: Grill from frozen until ready. Click here for Bean Mushroom Soup recipe. 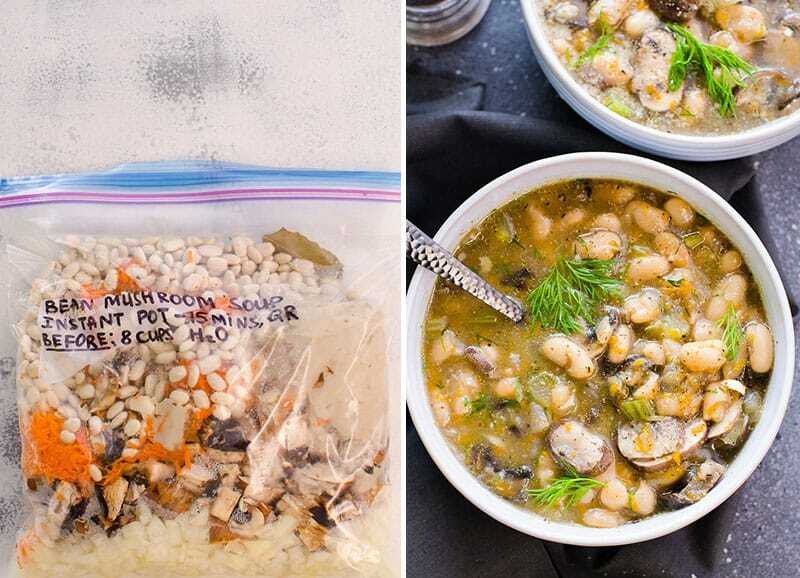 Instant Pot: Cook from frozen for 15 minutes with canned beans or 30 minutes with dried beans. Quick release. 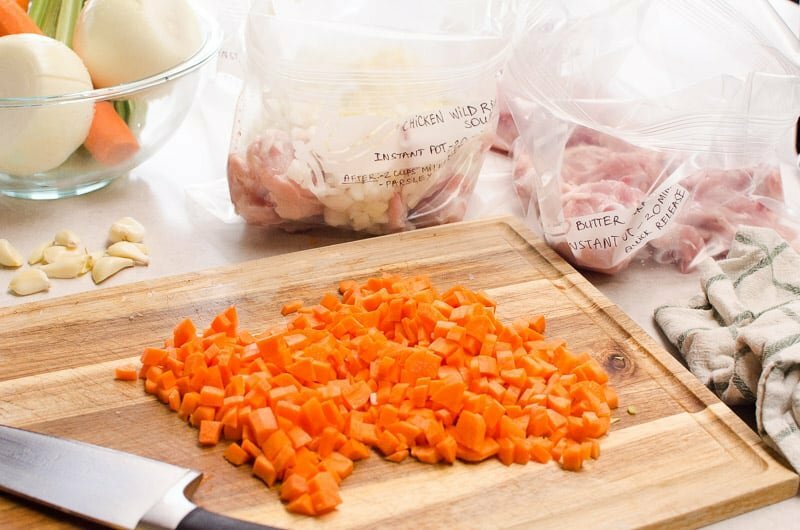 Slow cooker: Saute onion, garlic, carrots and celery, combine with other ingredients and cook from frozen with 8 cups of water (stock) for 4 hours on High or 6-8 hours on Low. 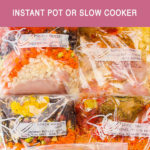 Instant Pot – 15 (30) mins, QR OR Slow Cooker – Low 6-8 hrs, High 4 hrs. Before: 8 cups water. After: Add 2 tbsp olive oil, dill. Busy? 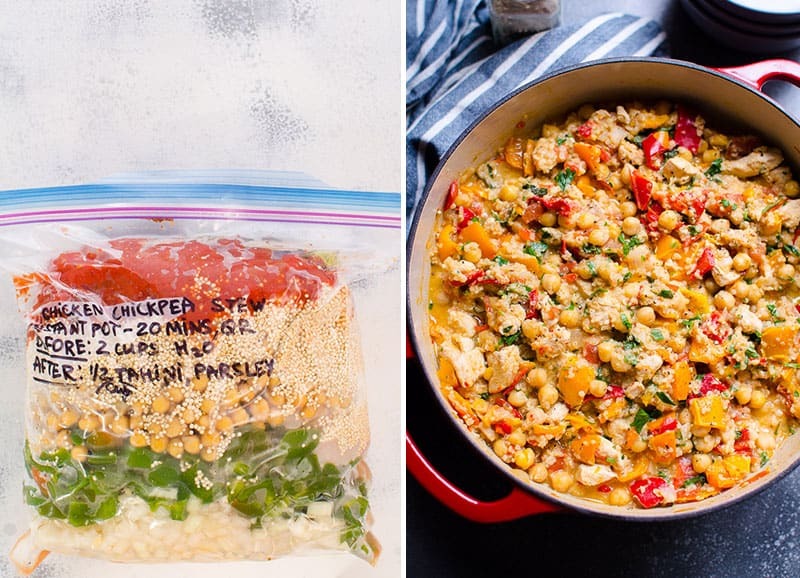 Learn how to meal prep 5 healthy dinners in 2 hours. 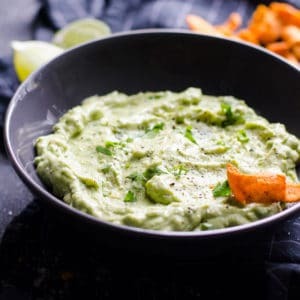 No pre-cooking and then just cook from frozen in Instant Pot or slow cooker. Aw, I remember those times. SO hungry and exhausted. Happy to hear and enjoy your sweet baby!!! I didn’t make these recipes yet but I had to comment to say how excited I am with the freezer meals. They all look amazing. I am homeschool mom and this is exactly what I need. I always see freezer meals that are made with lots of additives and unhealthy items. I will post again when I make these. Thank you so much for sharing. Love your site!!! I have been waiting for this post since last week I saw you prepping on Instagram. Thank you!